California is the nation's top milk-producing state and home to nearly 1.8 million dairy cows. California is also hot, especially for cows, which have trouble keeping cool when the weather gets warm. And when cows get too hot, their milk production decreases. Severe overheating can threaten cows' health and their ability to get pregnant and carry calves to term. Dairy farmers use fans and sprayers to cool cows in their barns, but there is a substantial need for better options. Existing systems use a lot of energy and water, which is costly for farmers. And climate change is raising temperatures and stressing California's water supplies. With funding from the California Energy Commission, we are among the animal scientists and engineers collaborating at UC Davis to test new innovations and measure how they affect electricity and water consumption, as well as cows' health and behavior. We are also evaluating the cost of these technologies and their potential for large-scale adoption in commercial dairies in California. Daytime temperatures are regularly over 72 degrees Fahrenheit for more than five months of the year in California's Central Valley, the state's main dairy region. Above this threshold, cows start to feel the heat. Cows are particularly sensitive to hot weather: Their body temperature is 101.5 degrees Fahrenheit, three degrees higher than humans, and they create a large amount of heat as they break down feed in their stomachs and produce milk. When water evaporates, it absorbs energy from the surrounding air, cooling the air. Evaporative cooling systems are commonly used in dry environments, where water readily evaporates. When outdoor temperatures rise, it becomes increasingly difficult for cows to dissipate body heat to the outdoor environment. As they try to regulate their body temperature, their respiration rates begin to increase. Then they start to drool and breathe with their mouths open, much like dogs panting. If they cannot cool themselves, their body temperature will increase. These are all considered signs of heat stress. Once it sets in, cows will produce less milk. They may have trouble getting and staying pregnant, and in severe cases may die. When summer heat skyrockets, humans can jump into a swimming pool or retreat indoors under the air conditioning and feel relief, at least until we see our electrical bills. Dairy cows do not have these luxuries. To cool cows, dairy farmers use a combination of shade, fans and water, usually when cows are in their barns. The cows are gently sprayed while they eat, usually for four to five hours per day, and while they wait to be milked. These strategies help cows regulate their body temperature, but use large quantities of water and electricity. 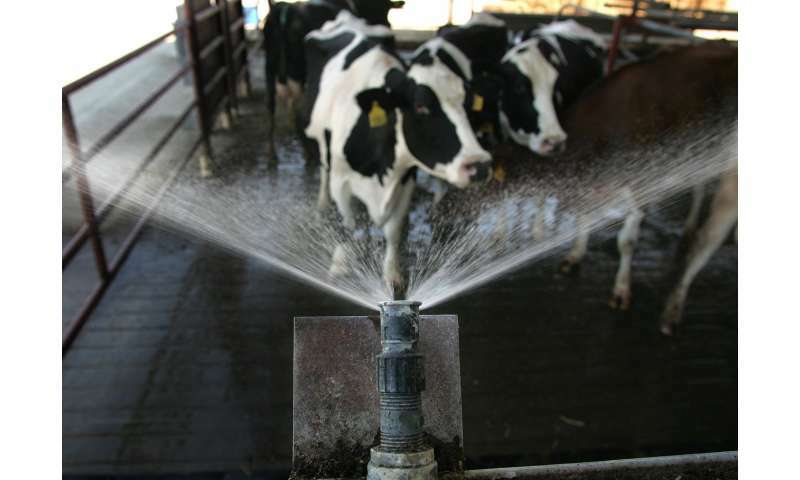 The average California dairy farm spends US$140,000 annually on utilities. Furthermore, these systems may be insufficient during extreme heat waves. During one stretch in 2017, temperatures in the Central Valley of California reached highs above 90 degrees Fahrenheit for 53 days in a row. Extended hot spells like this increase the instances of heat stress in dairy cattle. Our study is comparing four different systems for cooling cows. Two of them utilize evaporative cooling processes, which take advantage of the fact that when water changes from a liquid to a gas, it absorbs a lot of heat. This process produces cooler, more humid air, but can also be used to cool liquid water. Our first cooling technology uses mats buried approximately 4 inches underneath the sand bedding where cows lie down. Water flows through the mats and absorbs heat from the cows through conduction. The heated water then flows to a device called a Sub-Wet Bulb Evaporative Chiller, where it is cooled using a high-efficiency evaporative cooling process and returned to the mats to absorb more heat from the cows. Because the chiller produces cool water using evaporation, it is ideally suited for hot and dry climates like California. 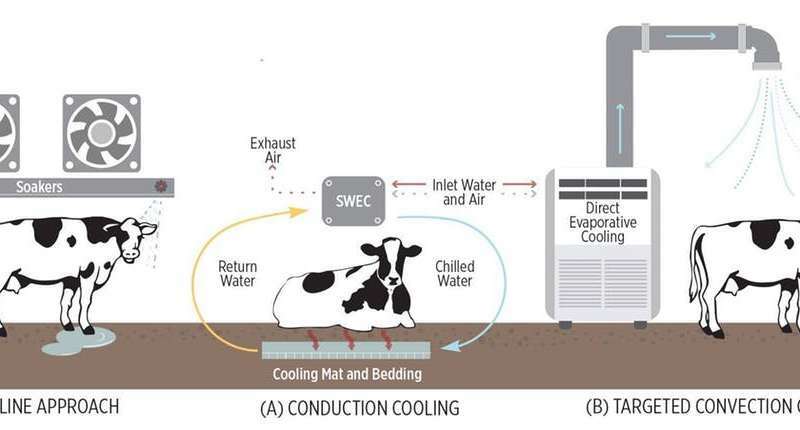 The second technology uses targeted direct evaporative cooling, sometimes referred to as a "swamp cooler," and fabric ducts to blow cool air on the cows in the areas where cows eat and rest. Swamp coolers are simple systems that work by passing hot, dry air over water to cool it down. For comparison, we also are testing two cooling systems that use traditional spray water and fans, similar to current technology on most California dairy farms. However, with one system we are working to reduce water use and improve cooling by moving the fan closer to the spray water to promote evaporation from cows' bodies. As water evaporates off of the cows, it takes heat with it. To conserve water, we also are testing spraying the water for a shorter period of time. During our first test phase, we tested all four treatments on 32 cows at UC Davis and collected data on their respiration rates, body temperature, milk yield and behavior, as well as weather, water use and energy use. Data analysis is underway. We anticipate that we will identify at least one option that will cool cows as effectively as current options, but will also save water, energy or both. Next summer we will test the most effective and efficient technology against the traditional spray and fan approach on a Central Valley dairy farm. Finding better ways to keep dairy cows cool is a high priority for this industry, as well as for cows' welfare. We hope our findings can help California dairies improve their productivity and keep cows safe and cool, while helping California meet its energy and climate goals.